Like most other countries of l'Ancien Regime, the Dutch had an international army (and navy). This kind of borderless culture was normal throughout Europe: diplomats, professors but also craftsmen would work for foreign states (famous examples: Jules Mazarin and John Churchill). Depending on the economic situation in The Netherlands, 40-60% of the soldiers and NCO's and about 25% of the officers were foreign. Many of those came from regions that had some connection with The Netherlands such as the Austrian Netherlands and Nassau. Even so, in 1793 it was a real DUTCH army. For example, all commands were in Dutch and 94% of the foreign officers could speak Dutch. Even in the real foreign regiments 20% of the officers were Dutch-born (only exception were the Swiss). In many other armies, the officers-class was mostly the domain of the upper-class of society. To a lesser extent this was also the case in the Dutch army, but as much as 30% of the officers were real career officers, climbing the ranks and - in sharp contrast to many other armies - less than 10% of the subalterns were "high born". The intellectual level of the officers was at least average (well above that of the ordinary enlisted men), judging by their "hobbies" and the number of languages many could speak. The interaction of the officers with their men was frequent and good. The Dutch noted that the opposite was the case in the British army, were it was not unusual for officers to see and meet their men only on the field of battle. Men enlisted for 6 years or a lifetime. Most of the Dutch born military were born in garrison towns, so it was probably a trade passed on from father to son and there existed many "military families". The Dutch military system was well organised. Payment of the men was done under tight government control and with a lot of paper work. Making a mess of things resulted in punishment for the responsible (regimental) leader. The necessary financial system for public finances was much more advanced than for example the British one. Apart from all of this, the Dutch spent a lot of money on their military machine: per capita 50% more than the British (9.10 guilders compared to 6.60). 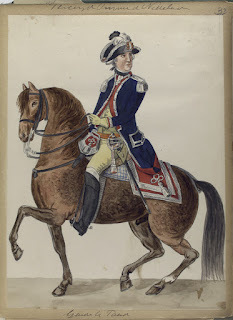 The Dutch compared their allies of the campaign to themselves as follows: the Hessians were all right but the British had some real drawbacks: they were badly led by York, whose preferred tactic was to retreat; they were poorly trained and had no stamina; they had no uniformity in their training, so each regiment exercised according to its own rules; discipline - harsh on paper - was hardly maintained which resulted in a lot of drunkenness and in frequent plundering of Dutch civilians; care for the sick was bad (which resulted in many soldiers falling ill: no learning curve here, as the same happened in Holland in 1799 and in Walcheren in 1809); contact between officers and men was almost non-existent. Questionable loyalties - as are sometimes mentioned - did not play a role within the Dutch army itself. It is unthinkable that units during a battle would perform less, because "they sympathised with the enemy" or such. They were professional soldiers, not political militias. Besides, there was no general pro-French feeling in 1793-94 in Holland. The only situations where a change of loyalties could be an issue was where high ranking officers could decide important affairs during non-combat periods, like prior to a siege or the changing of sides (from French to British by the way) of the Dutch fleet in 1799 or the retreat of the British from Holland in 1799 (where York probably bribed Brune - a Frenchman - to get away safely). A final remark: the armies of the Batavian Republic and the Kingdom of Holland were built from the prior Dutch army and also used lots of foreigners. These armies performed well in Holland, Germany and Spain and later on, as part of the French army, in Spain and Russia. So, one has to conclude that the Dutch army of 1793-94 was at least as good as any other of the time. It was a professional army with professional men. Rating it below average is not historic.